Skewers are so convenient to have for a barbecue because you can have them prepared in advance and also, once cool enough to handle, they are easy to eat as well. Mix all ingredients for the Marie-Rose sauce together and store in the fridge until required. Begin by mixing together the oil and the crushed garlic and then add in the thyme leaves. 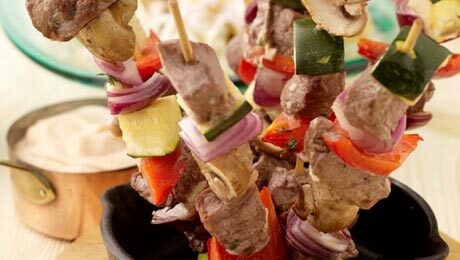 In a decorative manner thread the cubed beef and vegetables onto some barbecue skewers. Brush the beef and vegetable skewers with the garlic and thyme oil and then cook on a preheated barbecue for approximately 3-4 minutes on either side. Place the potatoes into a large saucepan of cold water and bring to the boil. Simmer until tender, strain off the water and allow the potatoes to continue cooking. Allow the potatoes to cool down and then slice into thick chunks. Place the potatoes into a mixing bowl with the red onion and 2 tbsp mayonnaise. Season lightly and serve immediately with the skewers and Marie-Rose sauce. If you are using wooden skewers ensure that you have soaked them in cold water in advance to prevent them from burning on the barbecue.